@itsmebetsy I have not seen a list posted anywhere but I can tell you of ones I have seen that are not on your list. It seems like there is no particular order they are added. Here are yours: lilac purple, purple argyle, green polka dots, green grass, hay bale yellow, teal argyle, blue polka dots, green argyle, plum purple. I hope I am not repeating this question - I searched for questions before posting. 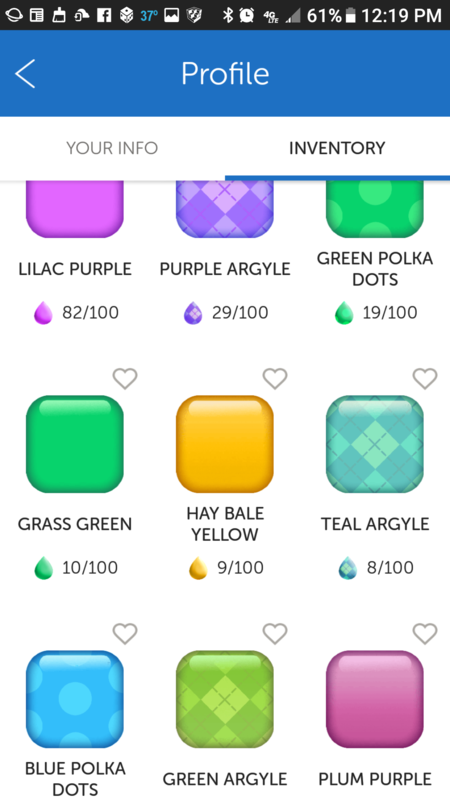 My understanding is that you can collect color tiles by earning enough points through the game and if you ‘heart’ a color you really want you will earn points faster for that color. Am I right? My question is: why am I seeing color tiles for games played by people who have just started playing Words? I’ve read that the color choices appear to be random with other players, I get that, but shouldn’t the same point system be in effect for all players? Just curious. @Tobler3494 If I remember correctly, when the Tile Styles first started they game everyone one like a sample and very close to finishing the second one. Perhaps they still do that for people who are just joining? n case there really is no other place, I'll go ahead and list the tile styles I've got in my inventory so far. I have the impression from a couple other people's screenshots that the initial 4 starter colors are randomized. I get my hearted color about 2/3 of the time, but have not kept actual notes on the odds. The Mystery Boxes start with Blue, Green, Purple. I believe Pink is next up, and I think there's a Wood, as well as Bronze, Silver, Gold, and possibly Brass? Not being able to get words on all of these is one of the reasons it's hard for me to remember what each is likely to contain. I suppose one reason people might not mess around with Mystery Box content ranges is because we don't have particularly good control about getting them, so you just get as much as you can. But if trying to decide if I should spend a few gold to win one more solo game, understanding what's in Pink vs Brass could be really helpful.